Scary moment a few days ago. I was back sampling at the cirque on Achill Island when the cloud cover dropped and visibility diminished considerably. Once I decided to head out I started walking uphill towards what I thought was where I came in. Next thing I know I am standing near the edge of a 300 meter cliff down to the Atlantic. It probably wasn’t as close as I remember it, but it sure woke me up. Once I got moderately oriented I took the only visible route back out of the cirque, which just happened to be up the very steep sidewall. Definitely wore me out, but I figured it was the safest route. I had been told to be mindful of quickly dropping cloud cover in Ireland, and now I see why. 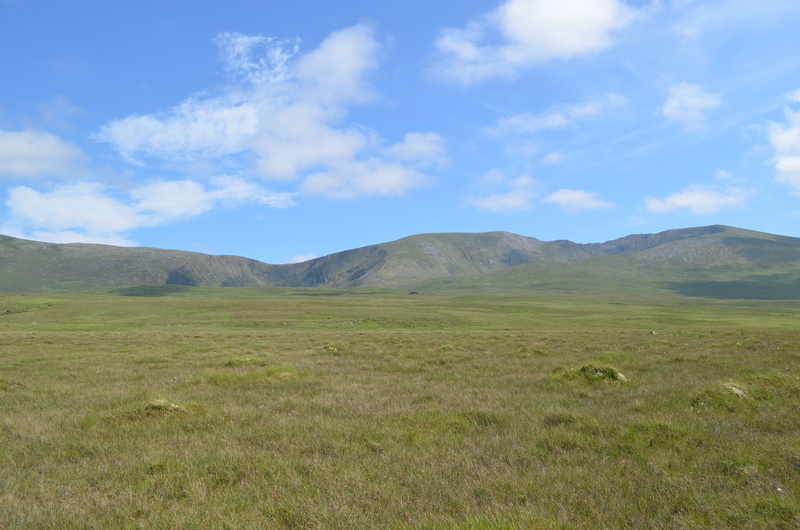 Since I had finished up sampling at the Achill Island site early I used the extra day to run back out to the Nephin Beg range and see if I could grab a few samples from a cirque we visited a few weeks before. While there have been steeper more technically difficult hikes this season, this one hike was easily the hardest one. It’s a three kilometer hike across a bog with hidden creeks that love to catch your feet in crevasses. The bog is followed by a sneaky climb that looks gentler than actuality. It didn’t help that the midges were out in force as well as their larger horse fly friends. They were distracting enough at the car that I neglected to put on sunblock. Something I am paying for now. Yet, even with all of the troubles I have encountered I am still in good spirits. That means two more sample sites completed and only two more to go. 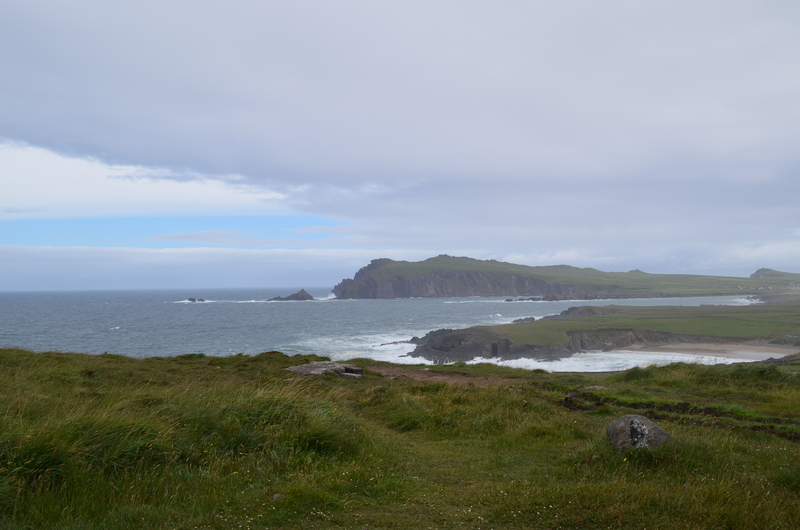 I am returning to Connemara today, and will finish there tomorrow, and then back down to Kerry to visit Dingle Peninsula. Today though, I am taking it easy. Getting some coffee in Westport and giving my clothes a much needed washing. Here is a picture of the cirque I visited yesterday, and one from the perspective of the cirque. Mark another one off the books. As of tomorrow I will be leaving Donegal for the year after finishing up the sampling in the Blue Stacks. It has been a hot past few days. Maybe not in DC terms, but definitely in Irish terms. 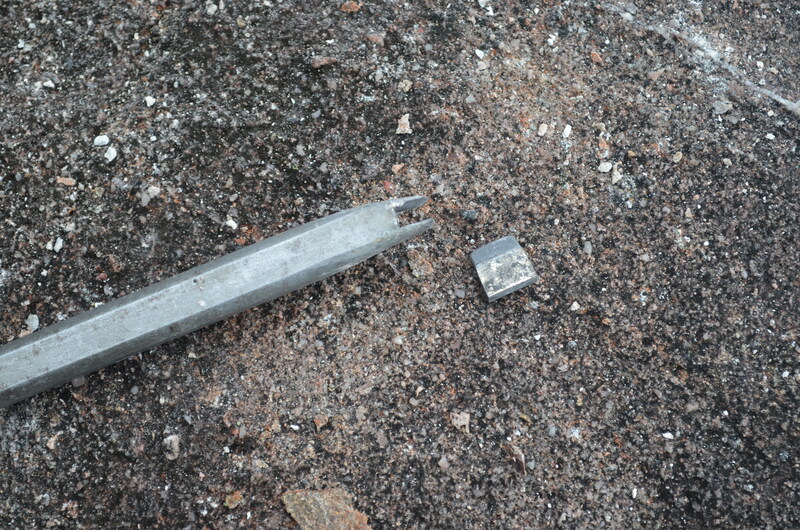 The added heat, long hike, and heavier granite samples led to some exhausting days in the field. 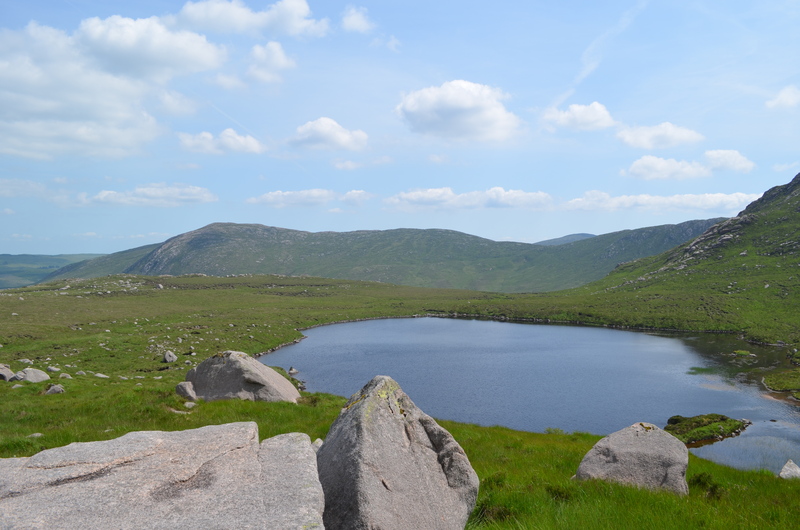 For that reason, when I finished up today I paid homage to Francis M. Synge, a Irish glacial geologist who would celebrate finishing a field site by going for a swim in the tarn. The water sure was cold, but felt mighty fine after the hot day of sledge swinging. With two or three more areas left to sample the equipment is starting to show wear and tear. I already broke one carbide-tipped chisel with Alan, and the replacement one without the carbide tip is rounding off quickly. It has already lost every bit of it’s padding that made it appealing in the first place. My work gloves are starting to get holes in the fingers, and my field pants are starting to develop holes where I won’t mention. My hands are starting to feel some wear and tear as well. Nothing bad, just sore from all the errant hammer swings that catch a knuckle or thumb. I got the good word that the first batch of samples has already arrived in Oregon, and the next batch was placed in the mail today. It will be nice having them waiting for me when I return in a couple of weeks. I’ll probably take a moment to breath, and then get right to processing them in the lab. That’s the plan anyways. It has been an eventful past few days. Most importantly, this last Tuesday saw the arrival of my good friend, and geology partner, Alan D. Pitts, on loan from University de Camerino in Italy. 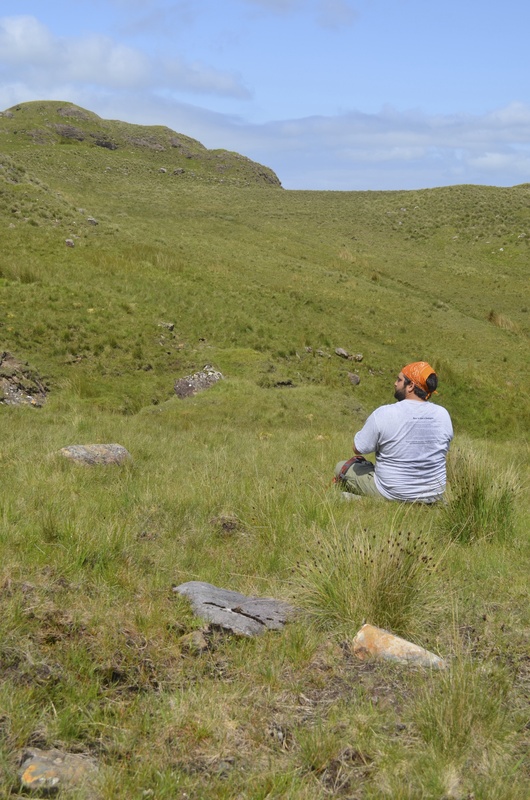 He had finished up another year of field camp instruction with the James Madison University group in Connemara and stuck around to help me out. 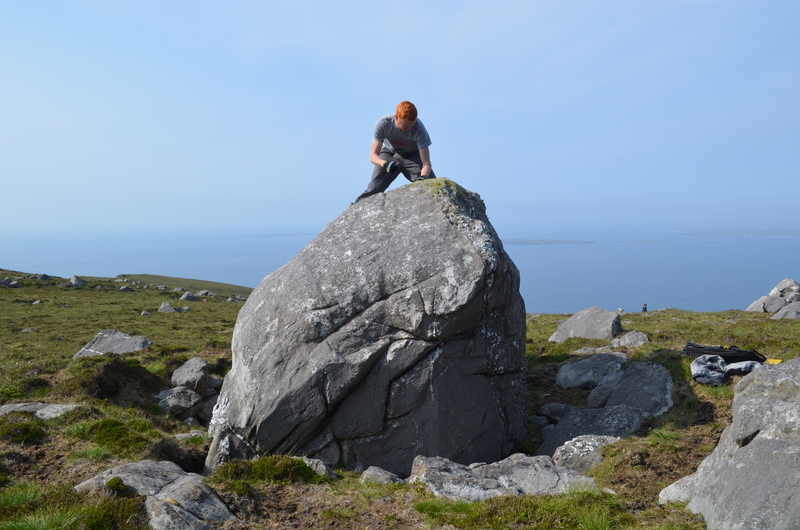 We decided to work on the cirque just north of Killarey Harbor in Mayo that we had visited when we were here two years ago. Working there also gave us the opportunity to visit with some local friends I had not seen in awhile. There may have also been some dancing involved, but I won’t get into that. What we aimed to be a one-day sample job slowly turned into three. I am lying here now after a long day of sampling writing this up and compiling all of the data we have gathered. The good news is that we were able to assemble pretty good coverage of samples that will hopefully help constrain the interpretation of this cirque’s glacial history. Most of our days were spent sampling, recording, and discussing. It was very helpful to have Alan around, not only for the extra muscle but also for his geologic know-how and familiarity with the site. As of now we have roughly two or three working hypotheses for this quite complicated cirque. This area may be one of the least straightforward areas I visit this year. What excites me about this site though is that the dates we get back from our samples will almost certainly confirm one of our hypotheses. This is a far greater tragedy than you can realize. With the Sruhauncullinmore site completed that leaves four more to go. Unfortunately tomorrow we drive back to Dublin so Alan can catch his plane home. Afterwards I will be solo once again. I am thinking I will head north this time to Donegal, and maybe work my way south. Yesterday saw the remainder of my companions depart back for home. I am now flying solo. But, just for a few days until a special guest arrives. 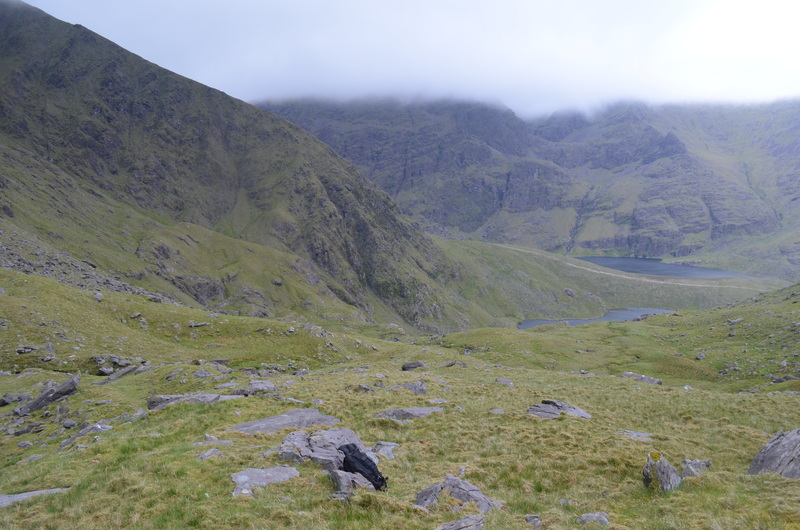 For my first solo day I was planning on finishing up the sampling at the MacGillycuddy’s Reeks site, but the weather decided to alter that a bit. I was up and out early and on the mountain right on schedule for what would be a long day of sampling. Unfortunately high winds and horizontal rain soon tested, and defeated, the waterproofing of my gear. 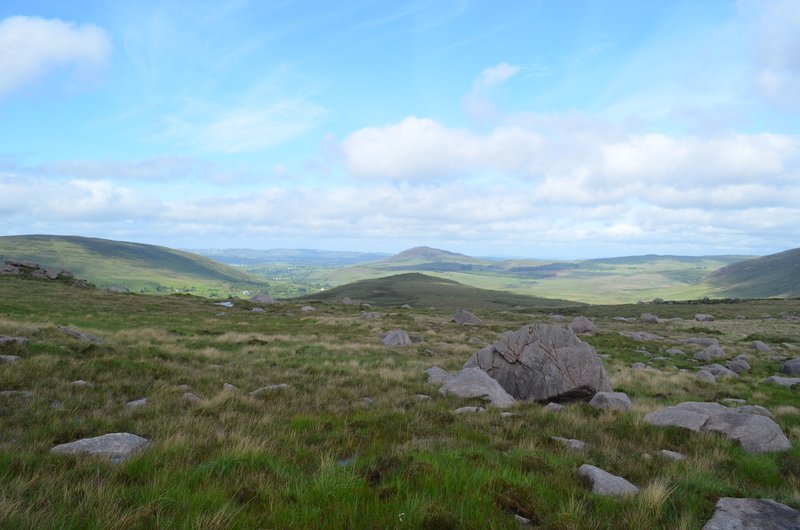 Along the way I did meet a nice man, Thomas, who knew a fair bit about the Irish glacial history himself, and asked for a copy of the research paper once it was published. I was able to grab two samples, but now find myself in a Killarney cafe waiting out the storm. It’s a bit misleading because it is sunny in town, but the mountains aren’t visible through the thick cloud cover. I’m going to give it another try in a couple of hours. Until then I will catch up on the data logging and enjoy my coffee. Here is a picture from Donegal the other day. Just to remind me of what the weather can look like in Ireland at times. We have had a few very productive days lately. 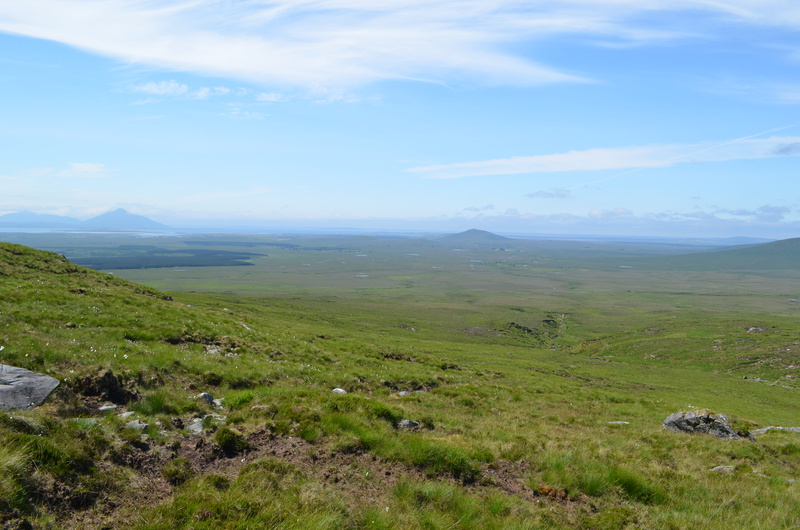 We sampled a good moraine set in the MacGillycuddy’s Reeks, site scouted a complex cirque with the help of Irish experts, and discovered a great sampling site with incredible views. 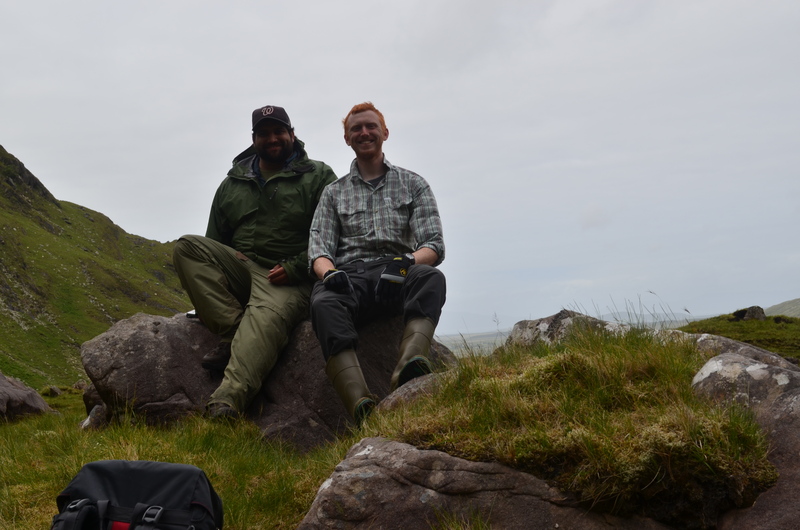 After getting an opportunity to explore the Dingle Peninsula we spent the following day sampling a lateral moraine system in County Kerry. What initially looked like a simple history turned out to be far more interesting. 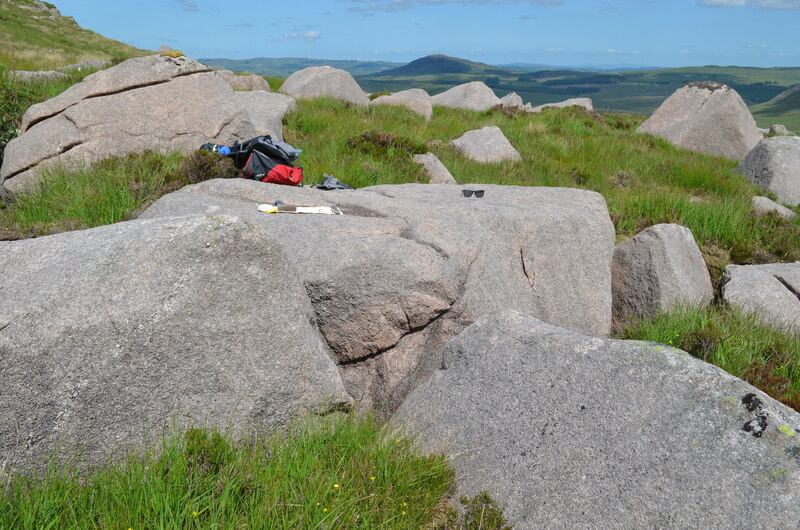 Multiple sets of moraines with multiple boulders available for sampling. We were able to collect a good number of samples, but I will still be returning some point in the coming weeks to grab some more. The day after we left Kerry and traveled north to Connemara, a place I had the chance to spend a good bit of time in a couple of years ago. We were joined by two more glacial experts, Marshall and Paul, who helped provide added eyes and analysis to the field sites. After exploring the region and discussing the ice sheet history, I took them up to a cirque I have mentioned here in the past. We had a great day in the field checking out samples and debating/analyzing the landforms, trying to piece together the history that was far more complex than I had initially realized. Much like the MacGillycuddy’s Reeks I will be traveling back here in the near future. Having finished up what we set out to do in Connemara we left todayand drove to Mayo and Achill Island. This is a beautiful place with some great views of the North Atlantic Ocean. We hiked up to the top of one cirque with the hopes of scouting a site that had the potential for sampling and were happily surprised to find a cirque riddled with bouldery moraines. Even though there was no planned sampling for the day we felt it necessary to grab what we could while we were there. It didn’t hurt that the weather was perfect. This one belongs on the revisit site with the others. Here are some pictures looking out from the large cliff face adjacent to the ocean, and one of myself demonstrating flawless sampling technique. As for now, I am pretty beat. It was a long day, but a well spent one. Back at it tomorrow. Yesterday we got into the field and explored up within the glacial valleys of the MacGillycuddy’s Reeks. What initially started as a reconnaissance/site scouting mission soon turned into me collecting my first samples as we encountered a few boulders that were too good to pass up. As we kept moving further and further into the valley we kept finding more moraines. Eventually the weather turned sour and we had to call it a day. The high winds and horizontal rain were a little too much to tolerate on the second day. The weather was worse today, especially up on the mountains, so we used this as an opportunity to drive out to the Dingle Peninsula and site scout some cirques. 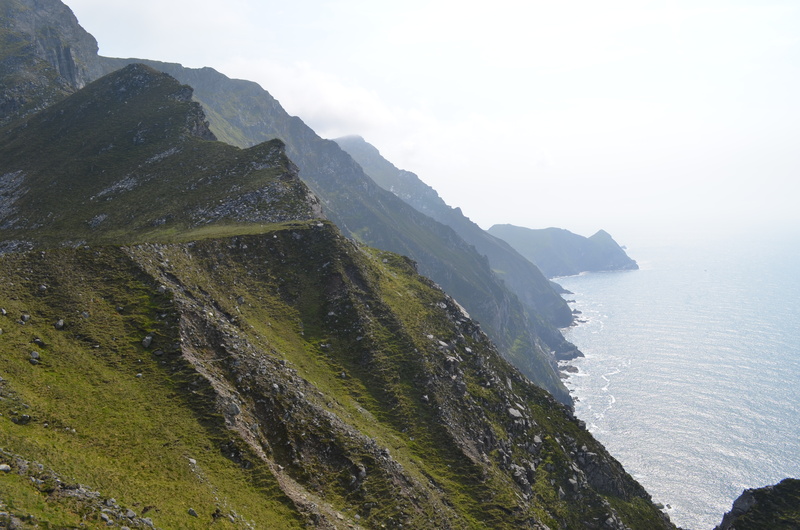 The peninsula is a beautiful area of Ireland with great views of the Atlantic Ocean from high cliffs. 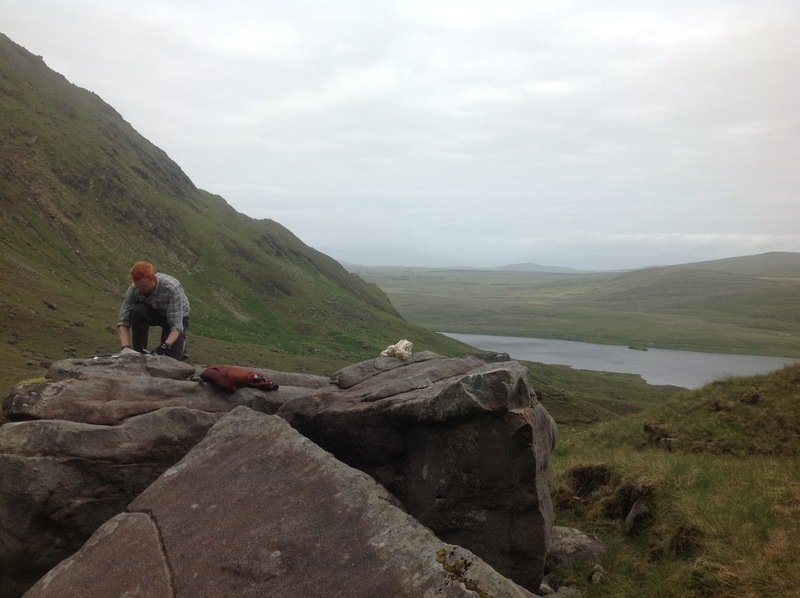 After driving the perimeter, we drove up and over Conor Pass to search out the cirques. Unfortunately the cloud cover wasn’t cooperating and it was difficult to determine if there were moraines or even boulders worth sampling. Fortunately we did find a cirque with an ice fall and the possibility of multiple sampling sites. It is also historically significant as the site were the ice ages were first recognized in Ireland. Here is a nice view on the peninsula. After two over night flights, visiting family in NYC, and more money than I like in baggage fees, I arrived in Ireland this morning. I was picked up at Shannon Airport by my adviser Peter and his field experienced wife, Jorie. Immediately we set out from the airport for Killarney in County Kerry with the goals of staying awake and prepping for the field work. 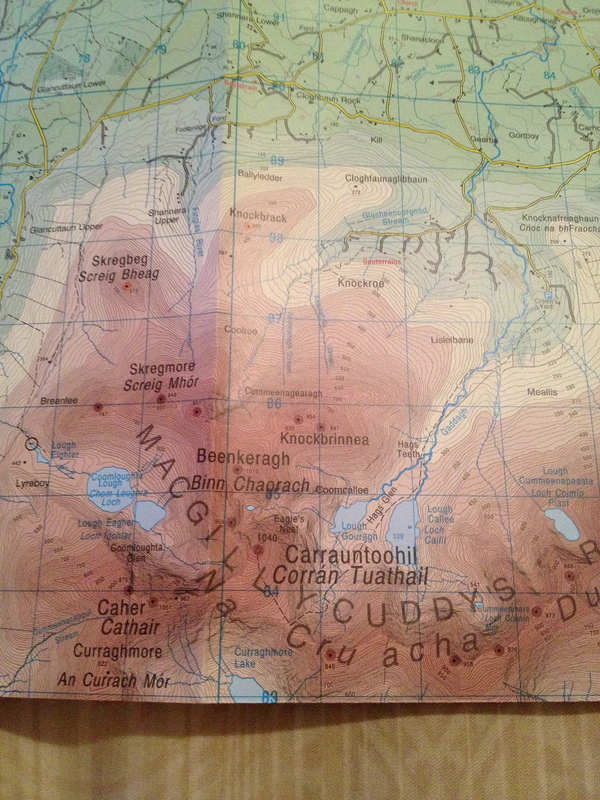 We grabbed a few supplies in town including this Discovery Series topographic map of Ireland. After getting settled and grabbing some dinner we drove out to eyeball tomorrow’s field site, the MacGillycuddy’s Reeks, in person. Having spent a significant amount of time scouting this site through Google Earth it was an impressive and exciting experience to see just how massive these features really are. In the handful of minutes we were there we already started putting together a game plan and finding areas to sample. It’s looking like this will be a good field site. Hopefully the weather cooperates and we stay dry this week.